Minibus hire has a big market in the UK and there are thousands of locations that can offer a minibus suited to the exact needs of your group. Alongside 15 seaters, 17 seat minibus hire is the most popular bus on the market, both in terms of the number of companies stocking this sized vehicle and the demand from consumers. Self-drive minibus hire is favoured by many people. Many people like to hire a minibus to be driven by themselves; hiring this way gives a group the freedom to travel how and when they choose without being restricted as to where they can go and how long they can stay. Self-drive minibuses can be hired for a time period starting at half a day ranging up to a number of months or years if you are looking to lease a vehicle, this flexibility is something that cannot be found when hiring on a ‘with driver’ basis. Some people choose to hire on a self-drive basis as it allows them to fully relax during travel without the presence of a stranger in the group. It can also be a cheaper option as having a member of the group drive the vehicle means that there are no driver wages to cover. 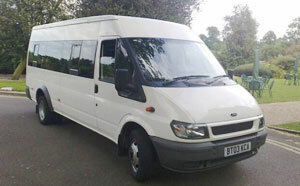 17 seat minibus hire is different to smaller vehicles in terms of who is eligible to drive. A minibus with up to 16 seats can be driven by anyone with a standard car licence, any bus above 16 seats will require the driver to hold a PCV (Passenger Carrying Vehicle) license or hold a category D1 licence. A category D1 will automatically be accredited to any driver that has a licence which was taken out prior to 1 January 1997. Any driver with a license after this date will have had to undergone training to gain the PVC licence. When choosing self-drive 17 seat minibus hire there are other things to consider that do not come when hiring ‘with driver’. You will need to have the necessary insurance, breakdown cover and a mileage allowance. Both of these sites are able to provide you with an insurance quote based on 17 seat minibus hire and the chosen time period. Breakdown cover is also supplied by the majority of the rental providers. It is wise to opt for a company that can provide cover which is 24/7, 365 days a year. Breakdown cover which is provided by a reputable company such as the AA or RAC can also be an advantage as they have full UK coverage. The mileage allowance will differ depending on which rental company you choose for 17 seat minibus hire. Some companies will have a set mileage limit per day whereas others will offer unlimited mileage, the latter is the better option if you a planning long distance travel.